Where did you hear about SHE Day! A friend? (If so, who?) Instagram? A poster? This will help us spread the word in the future. First, we are SO EXCITED you'll be joining us at SHE Day! Please know that SHE Changes Everything is committed to conducting its events and activities in the safest manner possible and holds the safety of participants in the highest possible regard. As a participant, I acknowledge that this Accident Waiver and Release of Liability (AWRL) form will be used by SHE Changes Everything, and the sponsors of the event of which I may attend and it will govern my actions and responsibilities at the event. In consideration of my application and permitting me to participate in this event, I hereby take action for myself, my executors, administrators, heirs, next of kin, successors, and assigns as follows: (A) Waive, release, and discharge from any and all liability for my death, disability personal injury, property damage, property theft or actions of any kind which may hereafter accrue to me or my traveling to and from this event, THE FOLLOWING ENTITIES OR PERSONS: SHE Changes Everything, and their directors, officers, employees, volunteers, representatives and agents, the event sponsors and event volunteers, (B) indemnify and hold harmless all entities or persons mentioned in this paragraph from any and all liabilities or claims made by other individuals or entities as a result of my actions during this event. I hereby consent to receive medical treatment that may be deemed advisable in the event of injury, accident, and/or illness during this event. If any medical treatment is necessary for my immediate care, I agree that I will be responsible for payment of any and all medical services rendered. PLEASE NOTE: This event is happening in partnership with Mount of Olives Church (MOO)! All MOO members and MOO MOPS members should email info@shechangeseverything.com for member pricing. We will verify your name with MOO. All others, get your tickets here! This event is being held in partnership with MOO to help bring it to the OC area, but it is not a religious event. EARLY BIRD TICKETS ($40 OFF) EXPIRES 4/18/2019. We will be using their multi-purpose building and beautiful outdoor courtyard! Your early bird purchase helps bring this one-of-a-kind-event to life! Thank you for your support of SHE! SHE Day is a day of wellness you’ve been waiting for. Step away from all the questions, the crazy, the judgement, and the nonsense that leaves you scratching your head. Instead join us for a day of soothing self-care, science-based education, and crazy levels of inspiration that will leave you refreshed and with an action plan for growing your own unique sustainable, healthy, ethical lifestyle! Here are just 10 of the MANY reasons you need to be at SHE Day! Find new nutrition strategies that work for your unique body that blow away all the lies and misinformation you're being fed as a woman. Spend a day full of self-care and goodness for your body. 78% of women admit that they put off taking care of themselves because they are taking care of others. Mind-blowingly simple ways to increase your impact as a conscious consumer! Confidently use essential oils for healing and wellness. Feel-good yoga and stretching throughout the day! Grab a pen because using proprietary worksheets you're going to create an action plan to take home with you and keep your momentum going. You'll KNOW what you'll be doing on Monday, instead of being inspired but confused or unclear, which is how some conferences can make you feel. 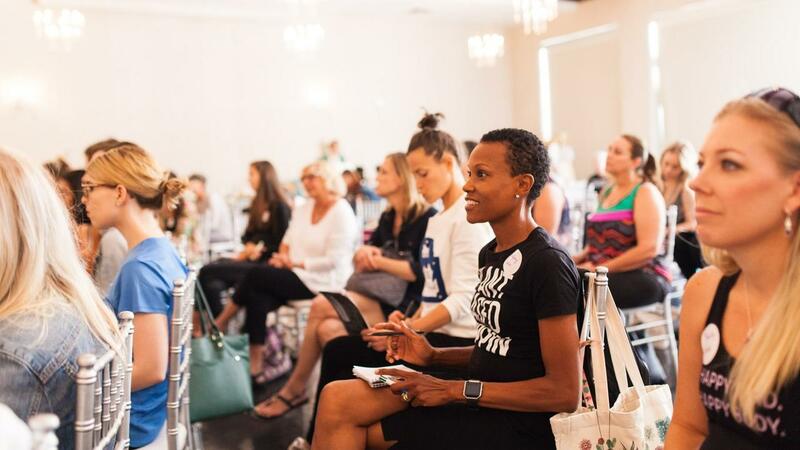 Make connections with a community of women passionate about sustainable, healthy, ethical (SHE) living! Hands down this was one of the highest pieces of feedback after SHE Day: LA - everyone was blown away by how wonderful and uplifting the whole group was together. You'll enhance your life - and the life of someone else - with 10% of your ticket going to a local organization. Enjoy allergy-friendly, nutritious food and snacks - and try new brands!